This 500 year-old castle manor riding center, one of the best in Germany, is an ideal equestrian getaway with its beautiful location in a lovely rural setting close to the Black Forest range. The equestrian center is easily accessible from both Stuttgart and Frankfurt. Dressage lessons on quality German Warmblood horses are available up to a high intermediate level, but the jumping and cross-country instructions are offered all the way up to Grand Prix level - mostly on Irish Hunters! Fritz Pape, a multi-purpose champion and trainer, guarantees sound lessons for riders of all riding levels. Whether you’re taking your first riding lessons ever, enjoying one of the beautiful country trail rides, learning to jump cross-country or polishing up your riding skills in one of the many seminars - there’s always the right horse for you! During the year we offer our Regular Riding Weeks that include private and group lessons, Hacking Weeks, Hunt and Cross-Country Weeks and as well as one- and two-week riding clinics for all levels of rider. 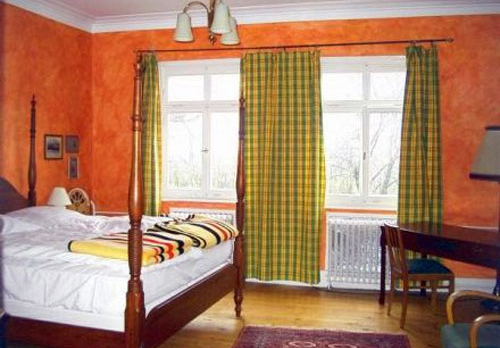 You will be accommodated in comfortable double rooms and enjoy tasty home-cooking. There are tennis courts nearby to play or you can bicycle, hike and go on coach rides. The castle is not only a riding center, but also a fantastic vacation destination - so non-riding partners are welcome to come along and enjoy the fabulous countryside as well! Rates include*: Accommodations at the castle, all meals, and riding package. Arrival can be any day of the week. Our regular program includes 10 hours of instructions in dressage or jumping, of which 5 are in group sessions and 5 in private sessions. For more experienced riders we recommend to purchase an additional 10 instruction sessions (in advance). Your riding hours can include some hacking out if you like, but you should be a confident rider ... not suited for novice riders. If you would like to have additional private instructions, you can switch 2 group lessons for 1 private session. No riding on arrival and departure day. Lessons are around 50 minutes in length while hacks are 1-2 hours. We offer different dates each year for people that want to join us for some exciting and exhilarating trail riding. Every day include two hacks of several hours or whole-day hacks though delightful, varied landscape. Hacking weeks are among the nicest activities of the year. The spring week is usually not as heavily-booked as the autumn week. No riding on arrival day. Once a year you are invited to join Fritz Pape on a week-long Hunt and Cross Country ride in the Black Forest. Two weeks training program. The contents of the program will be discussed individually with participants. Depending on interest, the program will concentrate on increased dressage, jumping or cross country. Lessons for beginner and advanced riders in dressage, jumping and multipurpose; seminars in jumping, multipurpose and hunt. The Castle Sindlingen offers competent and well-trained horses to make learning a pleasure. They offer a special adult program so that you can learn the first steps of horseback riding with intensive lessons in a quiet and stylish setting together with people like yourself in order to be able to take out a horse in a short while. The goal of this program is to improve equine and riding knowledge and perform practical exercises on horseback in all paces. The beginner and intermediate programs can be booked as a two-week-package. Whether you wish to get more routine on trail rides or want to learn dressage or jumping: these programs aren’t intended for ambitious show riders but for the intermediate pleasure rider. - for novices, riders wanting to improve, preparation for trail riding. 2.00 pm theory, e.g. an instructional video on the correct seat position, use of correct aids or safety precautions. Goal - Increased knowledge of horses and improved riding, exercises on horseback, training in all paces. Development Program Emphasis on dressage or jumping. Schedule as above. Goal - Dressage - improved position, half halts, lateral work, flying changes etc. Jumping - correct jumping position, from individual jumps to complete show jumping courses. Additional lessons and be booked at an extra charge. Riding groups usually have 4-6 riders. There are 80 horses in the stables, over a dozen of them for instructions. The horses are trained in dressage as well as in jumping - most of them participate successfully in shows and they’re all fine horses for cross-country riding. You will find two indoor riding schools (the biggest one measuring 27 x 66 metres) and ten acres of outdoor training grounds. Apart from the usual show jumping rails, you will find all the jumps necessary for cross-country training. For instance, several different banks, ditches, hedges, water jumps and a variety of natural jumps. There are two outdoor sand-dressage arenas to complete the training area, which augment the cross-country course. In the stables around the house there are 80 horses. The core of these is formed by the school-horses. The horses are at home in the dressage ring just as much as in the jumping arena. All the horses are reliable for hacking, especially the many horses from Ireland which we regularly buy on our visits to the Emerald Isle. Of course, these horses are also available for sale. There is a whole range of very good ponies available for the training of children. The climate in this area of Germany is most pleasant. The mild climate allows us to organize trip all year-round. However, the best time to visit is probably from May to mid-October as this time of the year is known for warm days and mild evenings. Rains can occur anytime throughout the year, but in summer they are usually of short duration. Some recommendations: English riding attire of breeches and high boots is correct, and a hard hat is recommended. Be sure to bring sun protection, as well as a sweater or jacket for the evenings. Rain is possible anytime in Europe, so you will need rain gear suitable for riding (NOT a poncho). Dress at dinner is casual, although you may wish to bring a dress/jacket for the larger cities if you are doing other touring before or after your ride. We suggest that you bring a belt pack for carrying your camera, sunscreen, etc. while riding, and some leather thongs for tying your rain gear to the saddle when not in use if you plan to hack out. Some of our riders like to bring along a "seat saver." Since many hotels in Europe do not provide soap in the rooms we suggest you bring your own. Hair dryers are available. Riding helmet (recommended for all trips)- Some Helmets are available, however fit cannot be guaranteed. Best to bring your own. You will stay in the castle, not one with turrets and towers, but rather a large dignified rural manor approximately 500 years old. It is surrounded by a (now dry) moat and lined with old trees forming a part of the park which opens to the south and continues on to include our spacious riding arena. Castle Sindlingen is both a holiday hotel and a riding school. The castle is situated on a ridge between the Schönbuch and the Black Forest. With its open hilly terrain at almost 600 meters above sea-level, the area offers wonderful countryside for riding and walking. The view is superb and extends to the Swabian Alb to the south and the Black Forest to the west. Sindlingen was once an agricultural manor house belonging to the Württemberg Royal Family. As the Summer residence of Franziska von Hohenheim, wife of Duke Carl-Eugen, it was known far and wide 200 years ago. The historical character of the place - designated as a place of historical importance - with its big old half-timbered buildings has been retained to the present day. You will be accommodated in rustic double rooms in the historic building and enjoy good home-cooking. The rooms are equipped with private baths. Internet: There isn't wireless LAN in each of the rooms, but there are public areas where access is possible. All meals are included in your tour price. Drinks will be on you! Please note that the main meal at Castle Sindlingen is lunch while a light dinner is served. Breakfast is served at 8:00 am. Lunch is served at 12:30pm . Dinner is at 6:30 pm unless you are taking a lesson in which case arrangements can be made for a later dinner. 1. EU nationals holding a valid national ID card. Germany is a signatory to the 1995 Schengen Agreement. (b) nationals of Australia, Canada and the USA for stays not exceeding 90 days in a six-month period; stay begins when nationals enter any of the Schengen countries. 2. Nationals of EU countries intending to stay for three months or more must register with the German authorities within seven days of arrival.